About The Lives of Noah and Joseph! 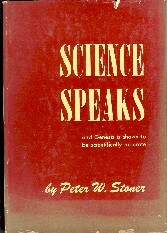 By Peter W. Stoner, M.S. 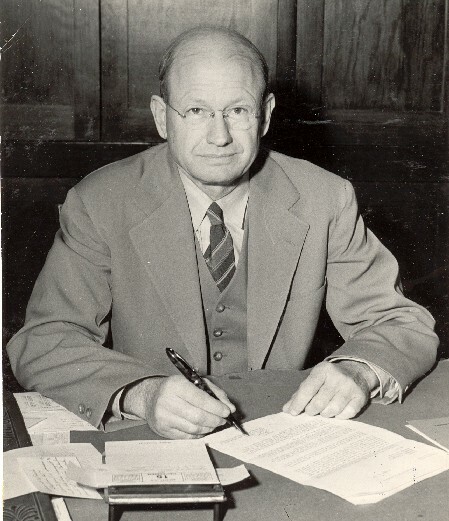 and Robert C. Newman, S.T.M., Ph.D.
Chairman of the Departments of Mathematics and Astronomy at Pasadena City College until 1953; Chairman of the science division, Westmont College, 1953-57; Professor Emeritus of Science, Westmont College; Professor Emeritus of Mathematics and Astronomy, Pasadena City College. ROBERT C. NEWMAN, S.T.M., Ph.D.
Moody press, a ministry of the Moody Bible Institute, is designed for education, evangelization and edification. If we may assist you in knowing more about Christ and the Christian life, please write us without obligation to: Moody Press, c/o MLM, Chicago, Illinois 60610. In this revised edition of Science Speaks Professor Stoner examines the findings of science and the Genesis account of creation. He considers the day by day order of creation and shows the accuracy of Moses' record. The well-accepted principle of probability is applied to Bible prophecy. A fascinating discussion centers around Ezekiel's prophecy concerning Tyre, Micah's predictions about Samaria, and Jeremiah's utterances dealing with Moab, Ammon and Babylon. Attention is given to Old Testament prophecy which finds fulfillment in the life and ministry of Jesus Christ. The attack by critics of the Bible has often come in the name of science. Faith has been threatened because the Bible has been thought to be in serious error. Today, through the efforts of Christian scientists, items of conflict between science and the scriptures are being harmonized. The evidence continues to accumulate in favor of the Bible as the product of Divine intelligence. Science Speaks is an enlightening comparison of Biblical truth and the established scientific data. ... Forward, by H. HAROLD HARTZLER, Ph.D. 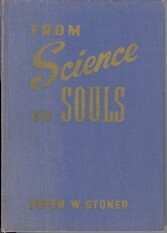 The manuscript for Science Speaks has been carefully reviewed by a committee of the American Scientific Affiliation members and by the Executive Council of the same group and has been found, in general, to be dependable and accurate in regard to the scientific material presented. The mathematical analysis included is based upon principles of probability which are thoroughly sound and Professor Stoner has applied these principles in a proper and convincing way. A generation ago (that is, a "generation" before Science Speaks was originally published, in 1952, by Van Kampen Press - Editor) there were dire discrepancies between Genesis 1 and the findings of science, and especially was this true of astronomy. The attack of the critic came primarily through the sciences, and the faith of many young people was wrecked because they thought the Bible was in serious error and therefore could no longer be trusted. Since that time, tremendous advances in the sciences have taken place. One by one the items of conflict between science and the Genesis account were harmonized. Today the last serious point of conflict between the Scriptures and science has not only been harmonized, but the findings of science stand ready to supply tremendous evidence that the Bible could not possibly have been written representing the education and culture of that day. Today, if our young people are properly taught in the churches, there is no possible excuse for losing their faith in college, for everything that they study in the physical sciences will speak of the unerring truth of the bible. If they will stop to consider, it will prove to them that God alone could have been the Author of the Bible. 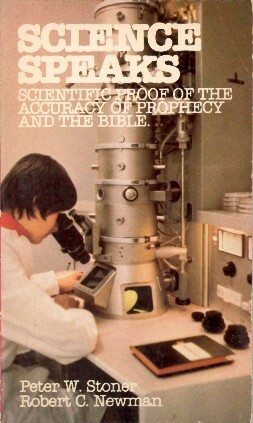 It is the purpose of this book to lay side by side the findings of the physical sciences and the statements of the Scriptures, so that anyone may observe their miraculous agreement. In setting up these relations, the scriptural statements have been taken exactly as they are given, neither adding to nor subtracting from them. No scriptural statement has been taken out of its context. No wild scientific theory has been introduced to explain a scriptural account. Only the best modern scientific material has been used. This scientific material would be accepted in any college science class. We might define science as "the result of the attempt of man to determine what God did in the creation and what laws He laid down." Science is ever advancing, and during the last few years there has been a tremendous acceleration. It is not the thought of the authors that this book is the final word on the correlation of the sciences and the Scriptures. They do believe that, as science advances still more, these correlations will be greatly improved and made still more positive. It is the intention of the authors to cite only a few of the correlations between science and the Scriptures which they consider to be most vital in establishing the miraculous reliability of the Scriptures. It would require many specialized authors filling many volumes to adequately cover the whole field. The references given are in no wise inclusive. They are only those which happen to be on the authors' desks, or are most easily available to them. If the reader does not have a good scientific background he should carefully examine all of these or similar references. ON MY DESK I have Young's General Astronomy (1898). Many changes have taken place in astronomy since this was the standard college text of our country. This book indicates that the heat from the sun comes from its cooling off. Science now believes that the heat of the sun comes from its changing some 4,200,000 tons of matter into energy each second. Young teaches that the solar system was formed according to the Nebular Hypothesis. That is, that our solar system started as a flat disc-shaped body of gas, that it shrank and speeded up as it cooled off, leaving small parts of itself behind to form the planets, and that the main central part became the sun. This theory today is discredited.1 Young believed the dark spots in the sky to be holes through which we looked into empty outer space. We now know most of these to be dark nebulas. Young tells us that all spiral nebulas are gaseous bodies in our own galaxy. We now know them to be galaxies, great aggregates of stars for out in space from our own galaxy. Young knows of nothing beyond our galaxy but outer empty space. We know now that there are billions and perhaps trillions of other galaxies. In fact Young's book is of relatively little value when it treats of things far from our own solar system. Texts of astronomy two hundred years old are very entertaining, but in the light of present-day knowledge nearly everything is in error. Genesis 1 is not just one or two hundred years old; it is several thousand years old. If it were written by man, representing the scientific ideas of that time, we should expect to find most of its definite statements in error. If we find them all verified by the best of our science today, we shall be certain that Genesis does not present the beliefs and culture of the day in which it was written. Genesis 1 has for generations been the ground for criticism of the Bible and of attacks on its authenticity. Let us carefully examine its statements, for it is in this chapter that God makes His main claims to His acts of creation. It will be necessary to read carefully and to analyze the account just as it is given---neither reading into the account things that are not there, nor omitting things which are definitely stated. There are thirteen acts very definitely named in this chapter. God claims in some places to have "created," in other places to have "made," and in still other places He uses the word "let." God also claims to have done these things in a very definite order. We shall be very much concerned with this order, for this account was written long before scientific information was available to guide the writer of Genesis. There is often disagreement regarding the date of writing Genesis 1. I shall not enter into a discussion of this subject, for while I have very definite ideas on it, the subject can in no way affect the present consideration. None of the scientific evidences which I shall use was established by science even within one thousand years of the latest date ever proposed for the writing of Genesis, and much of the scientific information was not even known as recently as the early 1900s. It is evident, therefore, that if this material in Genesis agrees with modern science, the agreement did not come from scientific knowledge when the Bible was written. Reference to the teachings of Egypt, Babylon, and other ancient civilizations regarding their theories of creation is found here.